The first named storm of the yet to start 2018 Atlantic hurricane season has Florida, Alabama and Mississippi declaring a state of emergency as Subtropical Storm Alberto drove north toward the U.S. Gulf Coast, threatening to bring heavy rainfall and flooding to the coastal states by Monday. According to Reuters, the first named Atlantic storm of 2018 is expected to intensify and bring wind speeds of up to 65 miles per hour (40 km/h) to the northern Gulf Coast when it approaches on the Memorial Day holiday on Monday, the National Weather Service (NWS) said in its latest advisory. A tropical storm warning has been issued for the Mississippi/Alabama border to the Aucilla River in Florida. Rainfall totals of between 5 and 10 inches (13-25 cm), with up to 15 inches, are possible from eastern Louisiana to Mississippi, Alabama, western Tennessee and the western Florida panhandle, the NWS said. All 67 Florida counties were issued the emergency notice to give state and local governments enough time and resources to prepare, Florida Governor Rick Scott said in a statement. 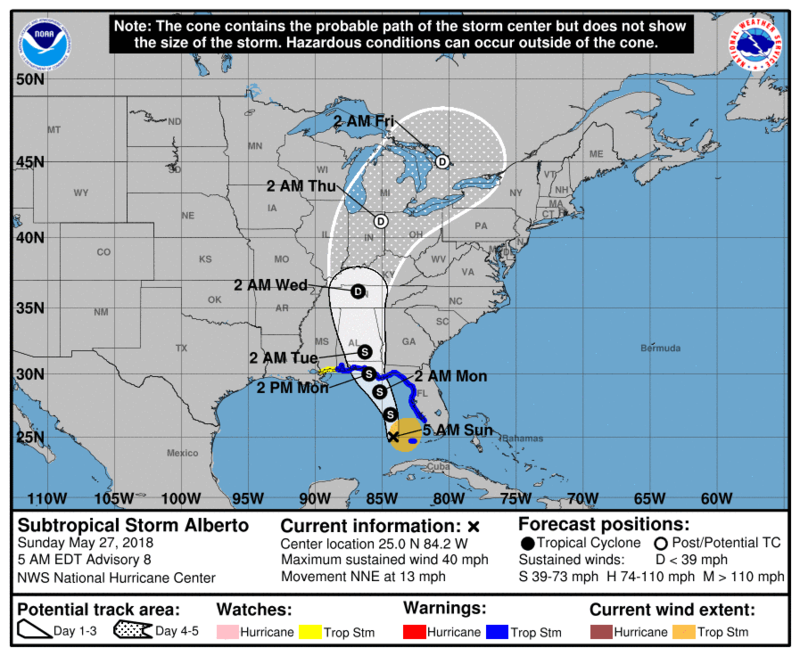 Alberto, which spun up days before the formal start of the 2018 hurricane season, was moving north at about 13 mph (20 km/h) with maximum sustained winds near 40 mph, and higher gusts, on Saturday, the NWS said. Gradual strengthening is forecast until the system reaches the northern Gulf Coast.